This was the leftover yarn from my "recent" Yarrow ribbed socks... I knit them toe up using Priscilla Gibson-Roberts' book Simple Socks: Plain & Fancy to make sure I used all of the yarn. My bumblebee's foot is 5.5" long and 6" around (blocksocks! ), and I used the Susanne's ebony US 2.5 (3.0mm) 4" double pointed glove needles and got 8 sts/inch. I ended up w/ 48 sts total for the foot & leg, knit the instep with k2 p2 ribbing for 5" and started the heel (which made a foot of 6" in length... I usually make the toddler socks without negative ease but with ribbing on the instep, and a little longer in the foot for my ease in getting them on a squirmbot and making them last a little longer on ever-growing toes), then a k2 p2 cuff til the yarn ran out. I'm awfully pleased at how quick they were. I haven't knit a pair of toddler socks in a long time, since I like to use dpns for them but the 7" ones just feel gigantic on the tiny socks and I've been avoiding it-- so the 4" are awesome. I am now wanting a pair of Susanne's ebony double points in US 1.5 (2.5mm) 4" length. I liked the sharper tip of the Susanne's, too... I didn't hurt myself with it (finger pushing knitter!) but I found it helpful when doing the somewhat awkward p3tog tbl for the short row heel & toes. Like I said, I was trying to ride the "glove length" needle wave and tried swatching the koigu on the US 2.5's, but the fabric was too open for my taste. My next choice were my US 0 Brittany in 5", nice length. 2 needles bit the dust. I guess I shouldn't be surprised, I mean, should I really be trying to knit with 2mm wood needles in the first place? Incidentally, I knit the foot of my left leaning cloverleaf sock on these needles, they were bendy but I didn't break them then. I wasn't doing anything weird or anything, thry both broke during the knit plain rounds of the instep pattern... too much decrease action makes britt a brittle needle. I've already emailed Brittany to have them replaced... though I don't see myself using them much in the future if they are. I used the 48 st CO again, toe up with the same PGR method, and am using Marnie's "S" sized directions for the instep (26 st repeat), with 22 stockinette sole sts. Since I'm using such smaller needles and was getting 8 sts/inch in stockinette in the brittanys, the difference will fit the little one's tiny feeties. I did have a change in gauge when I switched out the needles though-- the metals are resulting in 8.5 sts/inch. Shouldn't be a problem though, its at the heel where I switched out. I will have to try this one on him when its done and see if I need to change the CO for the 2nd sock though, adding a few sts to the sole or something. The pattern also pulls in so the fit should be good across the top. I am using a new (to me!) m1 increase I read about on Knitter's Review Forums-- lift up the st below the live st on the left hand needle and place on the L hand needle, knit this new st thru the back loop. No holes, and it results in an interesting "line" of sts when worked on top of each other in succession/EOR (I'll take a pic of this later). The KR link discusses places where it can be used appropriately, as it affects the subsequent fabric. He's such a little cutie! 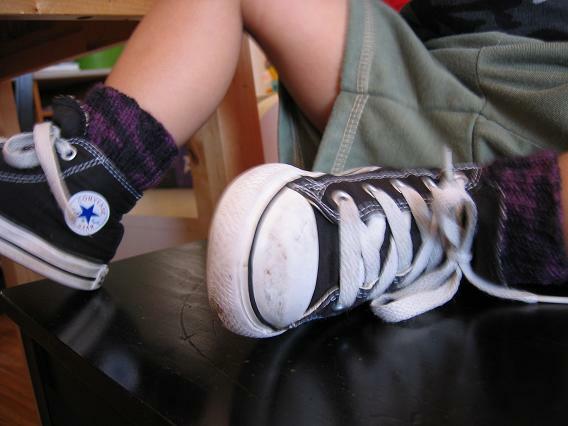 Love the toddler socks in the baby Cons! Toddler socks are a nice break when you want a quick FO. Seeing all the broken DPNs makes me feel sad that I should never bother trying wood or bamboo needles, considering I bent my 2.5mm addis on the first socks I knit with them! Love the socks with the converse! Very cool little man. And yes, you did knit socks at teh speed of lightning. BTW, I am so inspired by your recent pomo's that I am thinking about using that pattern with some Trekking I have...yay! That lil guy's so cute! What a precious smile! I often use 2mm bamboo DPNs, though I always end up switching to circs and finishing with Magic Loop. I want to be a DPN person because it looks so much more advanced to the non-knitters who watch me (I do try to make it look hard so that they appreciate my efforts), but once I learned Magic Loop I just kept going back to it. My socks turn out the same, no matter how I knit them; it only affects the process. Anyweasel, me using 2mm DPNs is so different from a toddler-mommy using DPNs. When I was growing up I was accused of breaking things with my mere presence. My mom would say that when I walked into a room, something would stop working. So maybe that's what happened with your needles. those teeny socks are so cute! and the new dragon ones are going to be adorable in that size....scales are definintely hott! What a cute little guy and great socks! Oh, how cute he is! And the toddler socks are wonderful indeed. I gotta say, I'm happy using Addi Turbos on those smaller sizes - they bend, but they do not break. He is soooooooooo adorable, and it looks like he loves the socks. you inspire me to knit for my little munchkin. That stinks about the needles - I can't knit with wood DPN's - I hold them too tight! The toddler socks look great - and fast! 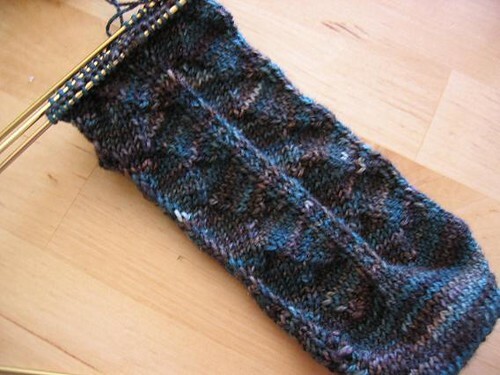 I am planning on getting Eunny's pattern also - I looooooove the cables in a different color! The dragon socks are great too - so many good patterns that it makes it hard to choose! The socks look great, and especially on such a cute model. I need to make LittleMan some socks. Maybe I'll do it with leftover yarn from my dad's birthday socks so that they can match. Those new Knitpicks dpns rock, you should try them. He looks so happy about his new socks, great job! 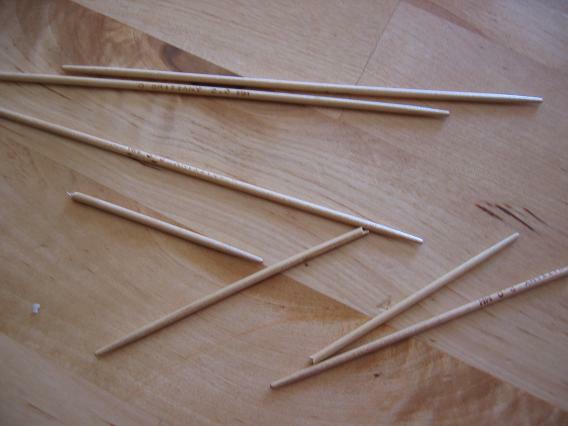 And I broke the same Brittany needles on my very first sock, so don't feel bad, it seems to be pretty common. Baby Chucks! That is one cool kid with one cool mama. That stinks about the needles. You'd be better off calling them - they don't check email too frequently. i've been eyeing my sock leftovers and my littlest niece and nephew's feet, too. i'm thinking, what aunt anne can't use could be fun for them! 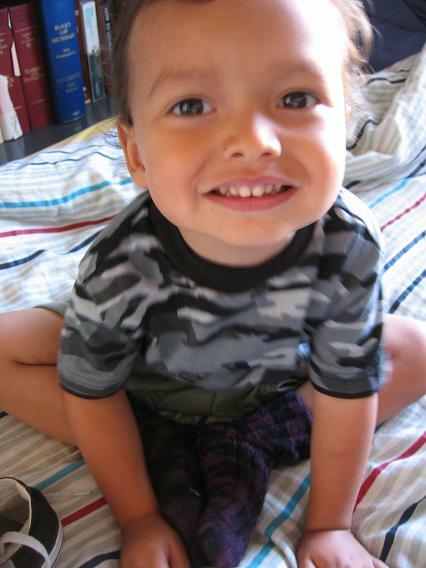 Cute kiddie, socks and chucks!! EEk, I better beware, I just got new Brittany's in that size. Cute socks for a cute boy!!! TOO CUTE TO WATCH!! !HEHE..ALSO SOCKS TOOO!! Those look like Brittany needles. Did you know that Brittany will replace broken needles free of charge? Just go to brittanyneedles.com and click on "Our Guarantee" to get the details. They replaced a size seven straight for me that had started to split at the tip.